If you're just getting started with freight shipping, the paperwork may seem daunting. But getting your shipping documents correct is critically important for shippers. Your shipping paperwork ensures that your freight shipment arrives at the right place at the right time and is handled in the right way. It also protects you from liability and losses and prevents unnecessary delays in your shipment. Here's what you need to know about some of the most common shipping documents. 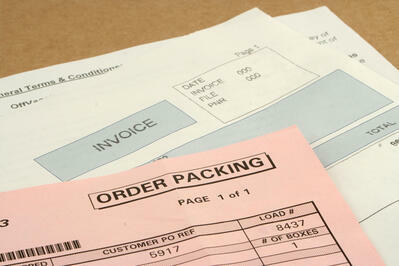 Bill of Lading (BOL): This is required for all freight shipments. It acts as a contract between you and your freight carrier and a receipt that acknowledges that the carrier has taken possession of your goods. It's very important to make sure your goods are clearly described, including descriptions of each item in the shipment, total weight, dimensions and the value of goods shipped. In the event of loss or damage, the BOL will serve as proof of the value of the goods for carrier liability purposes. The BOL also clearly defines where the freight will be picked up, where it is going, how it is to be transported and any special handling or delivery instructions. There are several types of BOLs, depending on whether your shipment is going by land, air or sea—we'll take a closer look at those in the next section. Freight Bill: The freight bill is your invoice; it tells you how much you owe your carrier for services rendered. It is generated by the carrier and includes much of the same information that is in the BOL, along with cost calculations based on the weight and dimensions of your shipment and the distance it will travel. It will also include any accessorial charges or other additional service or special handling costs. Make sure that the information on your freight bill matches the information you provided for the BOL and does not include any unexpected costs. If you don't understand a charge, ask. Packing List: This document stays with your shipment throughout its journey, from the time it is packed at your location to the time the final receiver or buyer opens up the package(s). It may be included inside the box for individual packages or be attached to the outside of a palletized shipment. It simply details all of the items that are included in the shipment, including weights, quantities and descriptions. It should match the information provided for the BOL. Proof-of-Delivery (POD): A POD is not required, but you may want to ask for one, especially if you are shipping high-value goods. This is a document signed by the receiver of the goods that confirms that the shipment has been received and is in good order. This may be provided in the form of a delivery receipt issued by the carrier or a freight bill or BOL signed by the receiver or consignee. The signer should note any discrepancies between the packing list and the goods received as well as any visible damage to the items received. Some carriers will provide POD as a matter of course, but you always have the right to ask for POD documentation. Shipping internationally requires additional paperwork beyond that used for domestic deliveries. Making sure you have the right paperwork and everything is filled out correctly is essential to getting your shipment across international borders. Your freight may change hands several times over the course of its journey, including a combination of land, sea and air transportation. It also needs to be approved by customs authorities. This requires very detailed information so that customs can easily verify and approve your shipment and your goods can be transferred between different carriers along the way. Inland BOL for land-based transportation, including trucks and rail. Ocean BOL for cargo transported by ship. Air Waybill for air shipments. The BOL transfers title of the goods to the carrier responsible at each stage. When importing and exporting goods, the carrier will need the BOL to prove that they have the right to have possession of the goods and to transport them into or out of the country. A straight BOL is issued when payment is made in advance. An order BOL is used when merchandise is shipped before payment is made. The packing list for international shipments may also be more detailed than those used for domestic shipping. Customs officials will use the packing list to verify that the shipment contains exactly what is listed in the paperwork. It should detail how and where each item is packed, so they can quickly locate items they want to inspect. It must also have net and gross weights and dimensions for the packages in both U.S./Imperial and metric units. The packing list should also detail any special handling instructions and any markings that appear on the packages. Certificate of Origin: This document identifies the country where your goods originated. It is usually signed by a Chamber of Commerce or another official body to certify that the origin information is correct. There may be country-specific forms required under certain international trade agreements. Shippers Letter of Instruction (SLI): The SLI clearly outlines the Incoterms™ that apply to the shipment. These include the responsibilities and liabilities assumed by each party handling your goods, including transportation costs, insurance, liabilities, handling instructions, delivery times and transfer arrangements. An SLI may also include a limited power of attorney that gives your carrier(s) the authority to act on your behalf while they have possession of your goods. A clearly documented SLI will help to ensure the safe and on-time delivery of your international shipment. Depending on your goods, the terms of sale and the countries you are importing and exporting from, there may be other documents required such as a bank draft or an ATA Carnet, a document used for temporary export. If you are shipping dangerous or hazardous goods, additional forms are required to identify what is being shipped, the potential hazards and safe handling instructions. Hazardous materials include materials that are flammable, explosive/combustible, toxic or infectious, oxidizing, corrosive, radioactive or otherwise present a danger to human health, the environment or property if not handled correctly. HAZMAT goods must be clearly identified, both on the package and on the conveyance that is used to transport them. Shippers dealing with hazardous materials must fill out a shipping declaration form that details exactly what is being shipped, the specific hazard class, how it must be packed and stored and what precautions must be taken during transport. They are also responsible for ensuring proper labeling with appropriate HAZMAT labels and HAZMAT placards that provide a clear visual identification of the hazard class the goods fall into. Label and placard design and dimensions are regulated by the U.S. Department of Transportation and other authorities. Making sure your paperwork is in order will go a long way towards ensuring that your freight shipment arrives intact and on time to its final destination. If you are new to freight shipping, your carrier or third-party logistics (3PL) company will be able to help you complete the required paperwork. If you are shipping internationally, make sure your 3PL is well versed in import/export law and paperwork requirements. Time spent up front filling out and inspecting your paperwork will help you prevent losses and damage due to improper handling and delays in getting your shipments through customs. Need help deciding how to prepare your shipment for domestic or international shipping? Pantero has a broad selection of cartons, packaging materials and options for palletizing and bundling your shipments. Our packaging experts can help you select the right materials to protect your shipment, whether it is traveling by land, sea or air. Pressure Sensitive vs. Water-Activated Carton Sealing Tape: Are You Ready to Make the Switch? Pressure sensitive packaging tapes are still the most popular choice for day-to-day carton sealing. Hot-melt and acrylic tapes are economical, approved for standard USPS shipping, and perform well for most packaging and shipping applications. When it comes to sealing cartons, you've got options. How do you know which type of packaging tape is right for you? Let's take a look at the contenders. Selecting strapping material? Here are a few terms you may encounter when comparing different types of strapping. Pantero. A whole new experience in packaging supplies. Are you ready for a Wild new option?